Once upon a time – and not so very long ago – inside was inside and outside was outside. They were two different worlds. Two separate worlds. The inside of your home was the living area. The outside was the recreation area – if you even used it for that. But now, the border between inside and outside is no longer so clear-cut. The lines of demarcation are fading. That’s because the thinking about the differences between indoor activities and outdoor activities is changing. There’s a trend afoot among homeowners across the land – across the world, really. That trend is to incorporate outdoor areas of the home in everyday activities. In fact, creating outdoor living spaces is one of the hottest trends going. Many homeowners are even hiring professional designers to assure that outdoor areas are as stylishly functional as indoor areas. Amenities like upscale patios, firepits, outdoor TVs, and outdoor kitchens are part of that trend. So is outdoor lighting. Outdoor activities were once relegated mostly to the weekends. A Saturday afternoon barbeque party on a sultry summer’s day. A cozy Sunday morning brunch on a crisp and sunny day in spring. But with more families spending more time in the outdoor areas of their homes, the hours of daylight no longer control the outdoor schedule. Just as indoor activities can occur at any time of the day or night, so can outdoor activities. 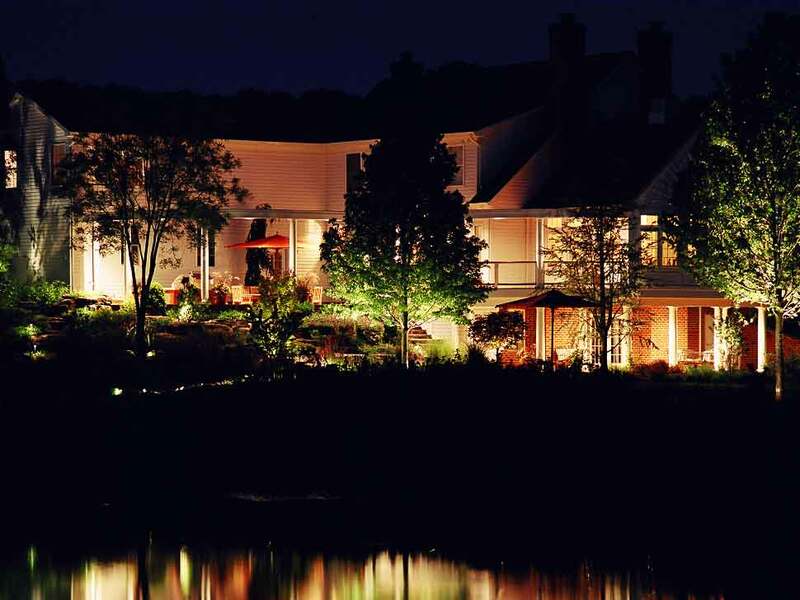 And that’s why landscape lighting is a crucial component of the trend toward outdoor living. With professionally designed and installed outdoor lighting, any outdoor area can be made ready for 24-7 living. 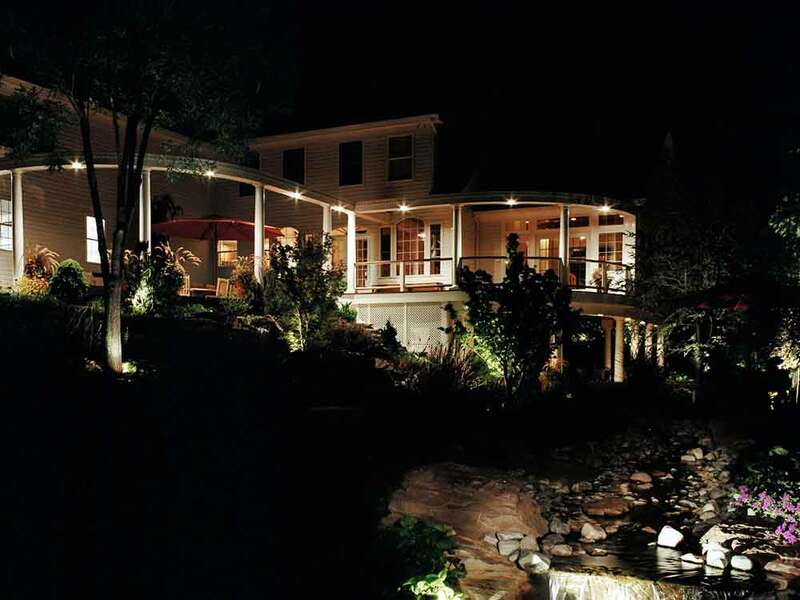 But landscape lighting systems are evolving right along with the trend toward outdoor living. Landscape lighting systems have been popular for many years. But just as the use of outdoor areas has evolved in recent years, so have our options for lighting those outdoor areas. Not so many years ago, lighting up a landscape was just a matter of assembling a system of bright lights. The aesthetics of the lighting often left much to be desired. But that’s no longer true. Your outdoor lighting can now be as fine-tuned as your indoor lighting. The advent of LED technology has helped to make that happen. LEDs provide a huge technological leap in the energy efficiency and durability of outdoor lighting. LEDs have also opened up an entirely new range of aesthetic options for outdoor lighting. But thanks to advances in automation, modern systems offer an amazing range of control over every aspect of the system. Now, it’s even possible for homeowners to control and adjust their landscape lighting systems using their smart phones. It might be said, even, that modern landscape lighting systems offer a greater range of control and versatility than many indoor lighting systems. That’s a good thing, because people are moving on out! This entry was posted on Monday, March 21st, 2016	at 12:48 am	. You can follow any responses to this entry through the RSS 2.0	feed. Both comments and pings are currently closed.